Volunteer-driven Wildlife Haven Rehabilitation Centre builds a new, sustainable habitat to help wildlife. A baby bunny that’s still too small to be released from Wildlife Haven Rehabilitation Centre. When animals are injured, stressed, and in need of help, people encountering them may not know what to do. Through its wildlife rehabilitation and educational programming, Wildlife Haven Rehabilitation Centre is there to advise, evaluate and care for injured, orphaned and sick wildlife across Manitoba. In a given year, Wildlife Haven provides care for around 1,700 animals; depending on the season, it can have as many as 200 to 300 animals in its care at a time. Around 70 per cent of the wildlife it rescues are birds, with the other 30 per cent comprised of mammals, reptiles and amphibians. 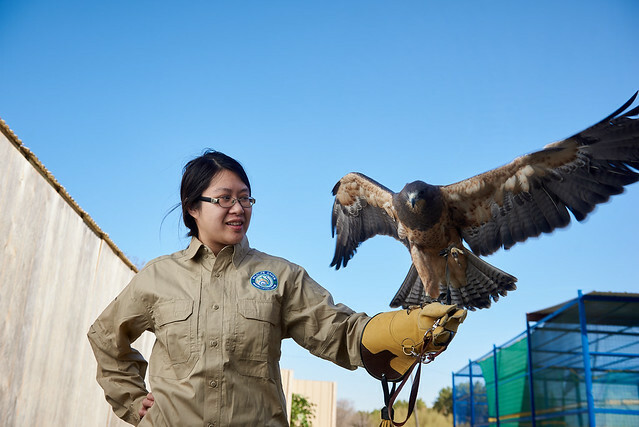 Wildlife Haven also provides educational programming for all ages around wildlife ecology and conservation, reaching more than 10,000 people annually at schools, day cares, seniors’ centres and other venues. Some of these stories are shared through its ‘wildlife ambassadors’ – animals that can’t be released back into the wild. Wildlife Haven has never had a permanent home. It previously operated on University of Manitoba land off of Highway 75 before moving to a decommissioned dairy barn in Île-des-Chênes, 25 kilometres southeast of Winnipeg. The outreach programming led it to secure its new location; Trans-Canada Corporation reached out after seeing a Wildlife Haven booth at an event. They provided Wildlife Haven with two 25-year leases on more than 18 acres of land, previously serving as residences for staff. Wildlife Haven launched a capital campaign to raise funds for completion of the new Wildlife Hospital and Education Centre, which is now in its final stages. The new campus includes a 9,600 square foot hospital as well as areas for educational programming and administrative staff. A separate building with two pools will house overwintering waterfowl. The site will also feature enclosures for different species, an outside pond, and two large flyways to help larger birds rebuild their muscles after being in care. Our volunteers have always had a dream that someday we’ll have a place to call our own and be able to do the best we can for wildlife. This was the start of the dream coming true. Many of the features on campus were designed with sustainability in mind – for instance, the main buildings are heated through geothermal energy, and the site includes tall grass prairie, a fruit orchard and a naturalized wetland. Wildlife Haven consulted with several organizations, including the Florida-based Clinic for the Rehabilitation of Wildlife and Winnipeg’s Assiniboine Park Zoo, in its plans for the new campus, and is ensuring its facilities meets standards set by the International Wildlife Rehabilitation Society. The Winnipeg Foundation made a grant in support of the interior finishings for the new Wildlife Hospital and Education Centre. Ms. Robertson notes that the grant helps Wildlife Haven further along in its goal to complete the building. “[The grant] will give us that opportunity to have people visit sooner and get everybody educated on the beauty of wildlife,” Ms. Robertson says. Wildlife Haven also holds an Agency Fund at The Winnipeg Foundation, which provides a stable, annual revenue stream for the organization. Ms. Robertson credits a Wildlife Haven Board Member who initiated the idea to establish the fund. Learn about Agency Funds on page 41. To learn more about Wildlife Haven’s capital campaign, visit WildlifeHaven.ca. To make a gift to Wildlife Haven’s Agency Fund, go to Wildlife Haven Rehabilitation Centre Endowment Fund.